Internet Plagiarism ➠ Good or Not? Everyone knows that copying content is a practice that is frowned upon in many academic and literary settings that students are often hard-pressed to come up with unique statements with paraphrased texts when citing sources. Someone has excellent paraphrasing skills, someone uses instant paraphrasing tool to quickly paraphrase paper, and someone hires paraphrasing service for this issue. But with the appearance of internet technology, internet plagiarism has risen significantly which became a growing concern for many because they fear that it will affect the quality of learning for their students and children. Although most have a negative view regarding plagiarism caused by information being available too freely online, there are some good to be gained from it too. If you are wondering how plagiarism is beneficial in the long run, you should read on. The internet has opened a floodgate to billions of people who believe have important things to share online. What happens then is that the digital world is peppered with articles coming from blogs and various other media with contents that are somewhat similar to others. One example of this is the articles falling under the health category. If you are going to look at several articles from various sources, you will find that plagiarism has been committed at one or two sites already. This does pose a problem but since it’s hard to figure out which one was the original, many tend to let it slide or at least call the attention of the writer. Unfortunately, most of the articles that you see online are a rehash of an original source where synonyms and reordering words are done instead of paraphrasing with context in mind. How then will you be able to rephrase your paper without committing plagiarism? You can start by using a plagiarism checker to determine if there are any copied content. From there, you will also need to check for grammar errors. If there are similarities present, you should check your dictionary if there are other synonyms that you can use in its place. What makes plagiarism a good thing? Plagiarism may be frowned upon but there are always two sides to a coin. Here are some instances that prove that plagiarism online does help. The grading systems of institutions are challenged by it. Most schools have a set guideline on how students are tested and graded based on their performance in their class. Unfortunately, this reinforces the need to cheat because you want to get better grades rather than honing your writing skills. Plagiarism has forced professors and schools alike to rethink how they approach writing so that their students will be more than willing to put on a lot of effort into building a unique paper. Challenging how the intellectual enterprise of research and scholarship works. Teachers often reiterate to their students the need to avoid plagiarism as much as possible but this only means that you are confining their skills to textbook rules and regulations and not giving them the freedom to express themselves which can hinder their communication skills in real life situations. Challenging the assumption of teachers, students, and institutions alike that writing skills are isolated and knowledge is basically stored information. Teachers often judge a paper based on its content and how it is structured but this only creates more instances for students to copy content because they don’t want to go below the standards of the school. Even though internet plagiarism has its ups and downs, it is still your responsibility as a student and as a teacher to create unique papers that reflect your ideas naturally without being hindered or hampered by structures formed by institutions. Actually plagiarism can ruin your reputation and of course, you can forget about the great grades if you will try to submit papers that full of plagiarism, typos or grammar errors. That’s why you need to try to avoid copying content and present it as your own, through your paper you should show that you understand the meaning of subject and present your own ideas, etc. In the case of typos in your paper, thinking that it’s not that important is a huge mistake since it for sure can affect your work. Whether you creating your paper from scratch or just rephrasing it, after finishing proofreading is needed, so make sure that your paper is correctly formatted. And if you are running out of time or simply not sure that can do all of it on your own, don’t worry we are here to help you. We have a team of professional writers who have years of experience in paraphrasing on topics from different fields. 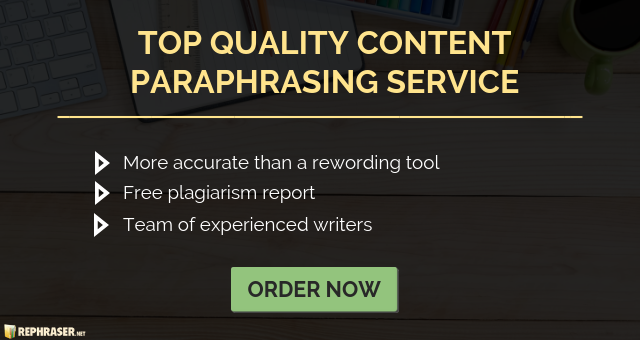 Whether you need content paraphrase, summarizing or editing services with us you will get full satisfaction because our team will help you to make your content unique, perfectly formatted and plagiarism free. Don’t hesitate and get the most out of our services! Know more about how internet plagiarism has helped by hiring our services today!